Tate Eresby has accepted the unusual sights and sounds of Golgotham and made it her home. Unfortunately, a magazine has alerted trendsetting hipsters to its existence and they’ve descended upon the community-along with an anti-Kymera faction known as The Sons of Adam. The sudden influx of tourists escalates racial tensions to a boiling point when two Kymerans are murdered and rioting fills the streets. Review: I read the first volume when it was released and I knew that I needed to immerse myself in the second novel. Finally with some time off, I took the opportunity to continue the Tate and Hexe’s adventures, two unusual characters. It’s always quite funny because every time I read the name « Golgotham », I immediately think of the Batman’s city, « Gotham City », well it’s maybe only me but the resemblance is disturbing. I thought I may finally understand the story about the hammer on the cover after my read. I must say that it was quite a strange object… Well then, I’m still thinking about its presence because I don’t have a clue. This is perhaps a little too subtle for me, but I’m already starting to scald assumptions. (Hey it’s true!) Maybe just to recall the Tate’s work? To show the revolt of this small town (yes I know I went that far, but hey, it’s a starting point, right?). But it is always a pleasure to discover more elements about this world. The idea of ​​a separate district is not unique but it is with pleasure that we interact with all these creatures and we can assist to the the clash of two completely different cultures. As I said at the beginning, we found our dear Tate spinning the perfect love with Hexe (yes she is a lucky girl!). But nothing can stay quiet that long, isn’t it? It is impossible of course. Everything starts to change when many tourists come in Golgotham, this part of the town that everyone avoids. But nothing goes well between humans and these creatures. And when riots broke out and that some murders are committed, nothing goes well. But now, even more than that, the Tate’s life is threatened. I was really surprised by the speed at which the chaos is settled, everything is quickly deteriorated and our two heroes are trying to understand what is happenning while trying to protect their own. Well I must say it is rather Hexe who will do the protection, because Tate is very good at getting into catastrophic situations. It was touching to see them together, evolving together; to see them facing discrimination as if nothing had happened, for the right to live together. I was both surprised and at the same time we suspect about the culprit behind all these events. I must say that everything is really strange but it is quite complicated to assemble the pieces to really understand the final words. I was so happy at the end of the novel to know the reasons for all this. I also enjoyed to have the chance to discover more information about the Hexe’s family because his life is actually quite mysterious. We still have much to discover but it is still a good starting point. This volume announces big changes in the Tate’s live, whenever it’s about her personal or professional life. All this announces once again big events whom we are curious to learn more about. 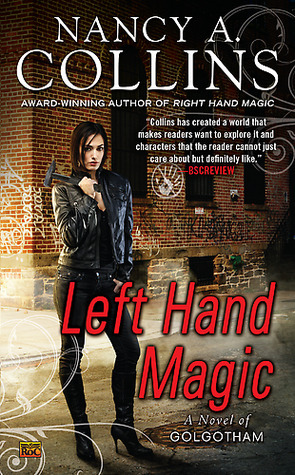 This entry was posted in Golgotham, Nancy A. Collins, Urban Fantasy. Bookmark the permalink. Hah, I thought of Gotham City, too! This sounds like a fun book and series. I can always rely on you to tell me about UF books I need to add to my TBR list. yes it’s a nice one, with a lot of creatures. me too, I need to read book 3! Thanks for another introduction. You’re fast becoming my UF gal! The cover reminds me of something Chloe Neill would have for a cover, which intrigues me more. I know, doesn’t make sense. I will have to look at the cover, I’m curious. Yes it’s a nice one with many great ideas. My pleasure, I’m glad if I was able to make you discover something new. I hope you’ll like it. You’ve been introducing me to so many new series! I’ll have to check out the first book. I’m glad if you could like them too. I think I would picture and think of Gotham City as well! Glad you liked this one as much as you did, especially for a second book in a series. yes difficult with the name. The first was a little better I think but this one is reallygood too. I’m happy to be able to make you discover some new books. It’s a real pleasure. This sounds like an interesting UF! It also sounds like it has an overall story arc, but no cliffie. YES! Looks like you found me another UF! I;m not a huge fan of the name of the city, either. It’s not very poetic, is it? The story itself sounds pretty good, though! Sounds like a fun series! the town name makes me think of Gotham as well, so you’re not alone. It is awesome that you have read so many good books lately! Lots of 4 star goodness! Holy cow, this is the second review I’ve seen for a book in this series in the last several days, and prior to that–NOTHING. I’d never even heard of it, and now I can’t wait to get my hands on it. THANKS. lol sometimes we all read the same thing!